I did a batch of 18 of these little guys last year. Every time I think that I have acquired all the possible large lots of these things, more show up. Shortly after I finished those, I got fifteen more in an auction lot, and have finally finished them up this weekend. In the meantime, I found another cache of twenty of them...at this point, I think I have enough. Now, I have to say, by modern standards these are some sad little figures. There is little detail, and the faces are very vaguely sculpted. However, it does emphasize a point I make every once in a while. The expected use of these things was in mass, and viewed as part of a scene during a war-game, rather than as individual show pieces. 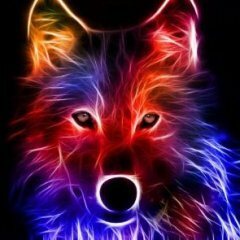 Therefore, the fact that there isn't a lot of detail means that you can knock them up pretty quickly and get to your mass effect. The one blue tunic stands out, but you can't tell whether anyone's belt is slightly off, or even whether they are cross-eyed. Well for Elves that is...bloody gooddoers...time for some Chaos Lord to bring those treehuggers down!! They look great, Rob! I love the individual detail on each quiver! And since you don't see that en masse, it's just for my own amusement while I'm painting. The Pointy Eared Ones painted up SPLENDIDLY...especially considering what small & poorly detailed miniatures the old Mini Figs were. They look WONDERFUL on their LOVELY group bases; like little vignettes. OUTSTANDING WORK! Good looking little army you've got yourself here. So, in the course of loading my miniatures onto the storage shelves last weekend, I opened a box of partially painted figures to find this group. Sold by Archive in the late '70s, I've owned these since then. My original paint job on them was unappealing enough that I didn't end up rebasing them in the great rebasing I undertook in the late '90s, and they languished until I started reworking vintage fantasy stuff from my collection around 2015. Unfortunately they have been languishing again since then, so when I found them this weekend, I decided to dry brush the heck out of them and base them up for gaming. So, as I mentioned, I was given a pristine old Grenadier set of Champions supervillains for Christmas. The “Starter Scenario Game Aid” is just a folded piece of paper with a hex map on one side and some suggestions on the other. But the “Figure Accessories” are two actual, substantial molded pieces: a pair of rockets and what I think is a hover-scooter. These two pieces are not pictured on the box art, nor are they listed in the set description. They definitely go with the set. The box was sealed when I received it. Question: Should I document and upload pictures of these accessories to the wiki? Following the muse today, I set aside my vintage Minifigs orcs for these two Adina hill giants. I’ve had one of the rock throwers for many years, although I didn’t know what it was for a long time, but recently managed to pull this pair off of eBay. There isn’t a lot to them, so both are now waiting while base treatments dry. I should have them varnished by tomorrow. 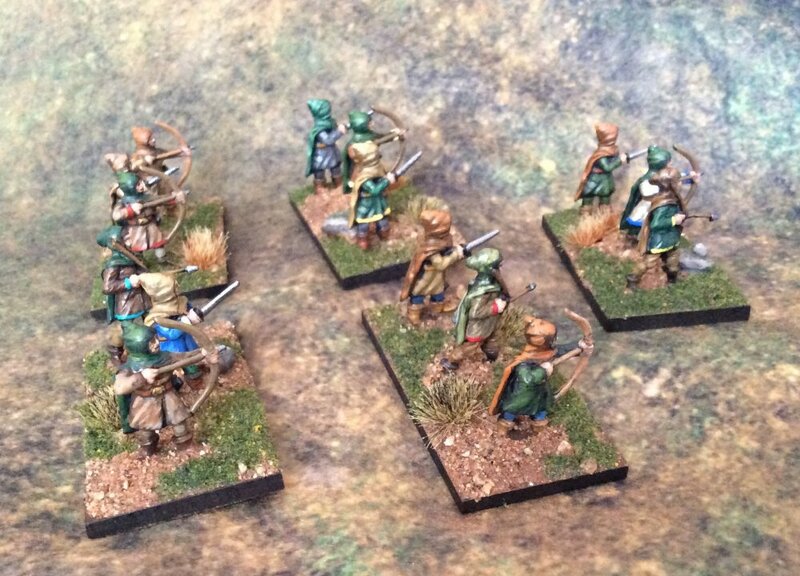 Finally varnished these guys today...as noted last weekend, they amount to a packet of Broadsword P11 and P12 each, and were acquired in a couple of different eBay purchases. Since they had some fun and interesting figures back in the day (~1980) and I didn’t have any of them, I conclude that none of my local hobby shops carried the line. My significant other is in a songing competition this weekend, and I’m along for moral support. Knowing that I would have some quiet time, I brought my travel paint kit and some miniatures. On the left are five Broadsword rangers, and on the right three Minifigs true orcs. The orcs are part of my Mythical Earth warbands project, but the Broadsword figures are a one-off. I didn’t have any Broadsword back in the day. Apparently none of the hobby shops I visited stocked them. My first encounter with them was in larger eBay lots while fishing for other old figures. I ended up with four of these archers in a large lot early in my eBay history, and then went looking for the command/personality pack later. I painted the swordsman/captain and the ranger-bard last summer. 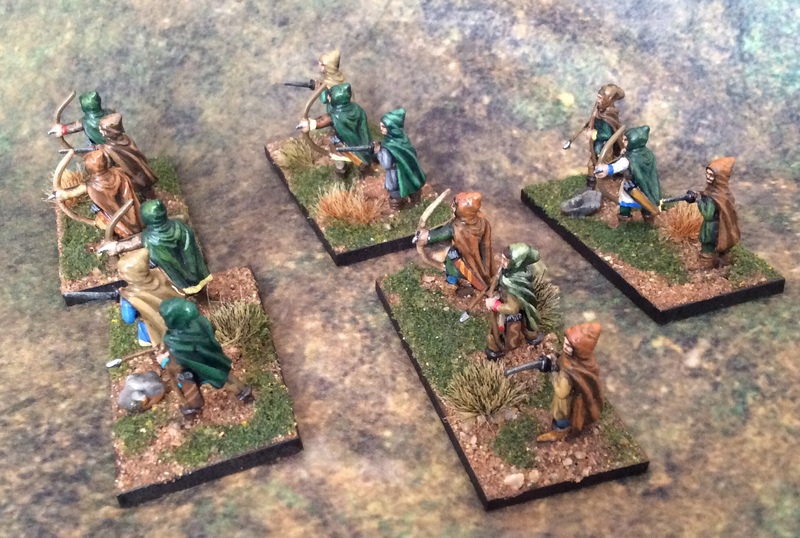 Now that they are almost all done, I hope to get them out as a unit of scouts in a Dragon Rampant game soon.